For fans of Harry Potter, Buffy the Vampire Slayer and the Dresden Files. Collins’ world-building is top-notch. You get a universe packed with supernaturals of every sort, the evil, the ones fighting evil, and the lovely gray area in between. Every realm is wickedly creative, deadly and completely un-earthlike. As Evan and Brooke work to develop their magical powers at demon-fighting school (this book will appeal to anyone who loves boarding school-type series like Harry Potter and always wanted more fight scenes and awesome weaponry—the action scenes are amazing) they develop new friendships and potential romances. And as I write that, it’s easy to make a comparison and say “oh this has similarities to (blank) but really, it’s a completely original, fully-fleshed world that feels like you could open your eyes and picture it swirling all around you. The author does a great job in vivid descriptions, world-building and detail. One of the best-described fantasy worlds I’ve read this year. There’s everything you would expect in a fortress filled with teen supernaturals learning to use their powers for the first time—including power struggles, friend groups, and drama. Classes and weapons/magic training all have a completely new spin. The whispers about “what is Arantay, really?” and wistful, slightly creepy dreams were snuck in nicely. You would think in a school filled with vamps, zombies and demons, whatever he was couldn’t be THAT big a deal, so that they were all freaked out really amped up the tension in addition to Brooke’s attraction. But all may not be well. Evan still seems to be in danger, from forces that no one can explain, and as the attacks continue, will they be able to identify who is behind them before he is abducted or killed? This is the first installment in a trilogy. An epic fantasy world of magical powers, creatures, goblins, orcs, and Dark Lords. Evan and Brooke are teenagers who don’t quite belong. Evan’s an orphan, who’s grandmother has passed away, and he’s in an orphanage. He’s the victim of constant bullying. Brooke is a popular girl in school, but her home life leaves a lot to be desired, her mother works constantly, her father’s a couch potato and drunk, her older sisters don’t speak to her, and her older brother has attacked her and scared her. 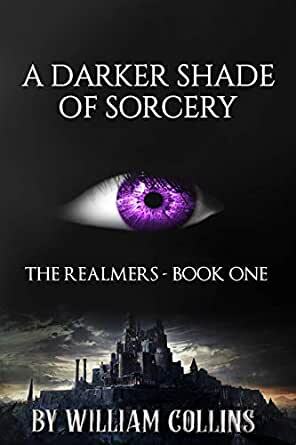 Each teen is taken to another realm to enroll in a special school that will teach them to be demon hunters because both Brooke and Evan are endowed with magical powers. They learn how to fight, wield weapons, and harness their magical powers. The two also make friends and develop crushes and go through regular teenaged angsts with bullies. The story is compelling, action-packed, fast-paced and fun. I don’t want to give too much away, but these teens are awesome and wielding some serious powers. Traitors and dark plots are revealed, elusive heroes come forth, and this story is the perfect introduction and set up for the next installment. The world Collins creates is similar to the magical elements in Harry Potter, the creatures, monsters, and epic-ness of the Lord of the Ring trilogy with the coolness of Twilight. All in all, a delightful read. That level of description is rarer than I’d wish. The imagery is clear, the author picked just enough detail to set the scene, but not enough to bog it down, and the use of metaphor is elegant. Bravo. I prefer stories with less world building, however. It was like the author suddenly realized he could write as much magic as he wanted, and like a kid in a candy store, he decided he wanted it all. Demons, faerie drugs, shifters (including wereleopards and werebulls), orcs, elves, djinni, magic schools, portals to other dimensions—this book has it all. My tastes run to magic that’s a little more restrained. If you require stories that demonstrate an absolute command of writing craft and don’t mind levels of magic use in excess of Harry Potter, you should give A Darker Shade of Sorcery a try. But even if you view magic in a story as more of a spice than a food group, the writing is good enough that it’s worth checking the Look Inside.